Perfect for educators working with 3-9 year olds. Music is amazing for growing brains. Gain insight, confidence and tools to easily implement music making into your learning environment. Learn skills to help children who need to move their bodies, encourage spacial awareness, cooperation, creativity and social skills. Understand how music making can engage kinaesthetic, visual and aural learners, and help all children to be successful active listeners. Learn how to look after your voice, to avoid hoarseness. Fits seamlessly into the Early Years Learning Framework; encompassing all aspects of Belonging, Being and Becoming. Don't spend a fortune on equipment and resources to deliver a highly valuable program. 90 minute runtime, delivered after hours. Perfect for educators working with children aged 3-9 years. If your institution would prefer an invoice rather than online credit card bookings, that can be arranged. Please contact us. This workshop is presented by early childhood music specialist Julie Murray BMus, an accredited First Steps in Music teacher through the acclaimed Feierabend Association for Music Education (USA) and owner of Sounds Like This. Julie has studied Kodaly (pronounced Ko-dye) based early childhood music instruction with Anna Mlynek-Kalman (Australia), Dr John Feirabend (USA) and Lucinda Geoghegan (Scottland). Julie established Sounds Like This for Kids' music based early development program with clever insights from a brain’s trust of experts including speech pathologists, movement coaches, singing teachers, kindergarten educators, other music educators and neurologists. Julie has been teaching for more than a decade and specialises in play based children's music classes which she delivers to hundreds of children each week at kindergartens, daycares and her own studio. She incorporates the Kodaly philosophies; that music making should be developmentally scaffolded, child-led, intergenerational learning through exploration and discovery, while protecting the child's vocal health, promoting and supporting healthy relationships, building confidence, encouraging creativity and development of aural training and musicianship through singing and play. These professional development session will greatly benefit daycare, kindergarten and primary class room educators, playgroup facilitators and even swimming teachers who use singing in their classes. If you want to make more music with the children in your care, but you're not sure how best to do it, this is for you! What do other educators have to say? 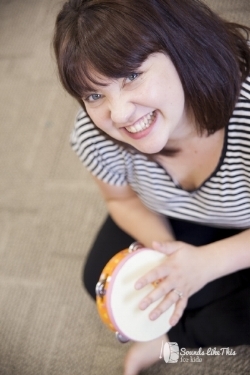 "Julie’s passion for music and child development is contagious and inspiring. Every aspect of her class contains elements that can be incorporated into a kindergarten program, simple ideas that anyone can do (including those who feel their musical ability is lacking). The ideas and skills gained will delight, capture and engage the children you are teaching. I cannot recommend Julie and Sounds Like This For Kids enough. I especially loved the story telling component and how the books came to life. Thank you so much for sharing your passion, skills and knowledge."